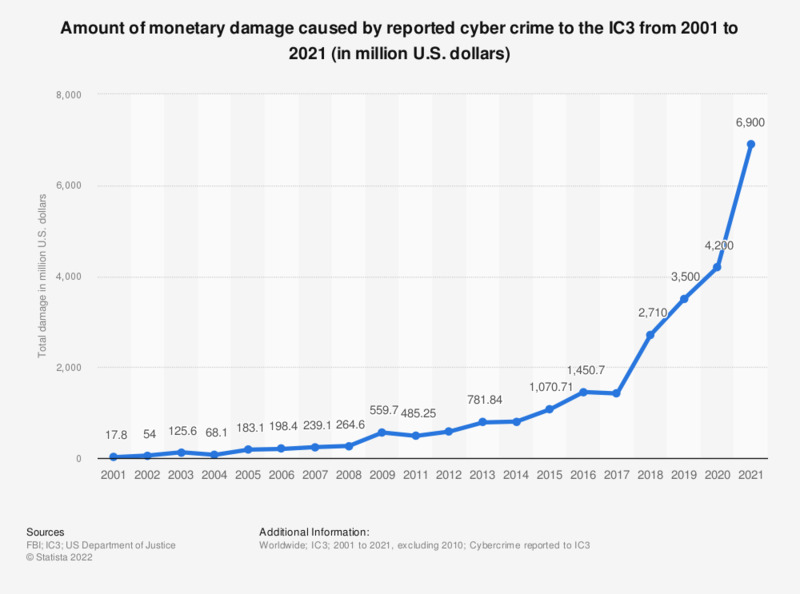 The statistic shows the amount of damages caused by cyber crime reported to the IC3 from 2001 to 2017. In the last reported period, the annual loss of complaints referred to the IC3 amounted to 1.42 billion U.S. dollars, up from 782 million U.S. dollars in 2013. The most costly cyber attack consequences for global companies in 2016 were losses suffered through business disruption and information loss. That year, the majority of data breach incidents were related to identity theft, followed by financial and account access. In 2014, the United States accounted for 83.96 percent of complainant losses. No data available on reported cyber crime losses in 2010. The numbers refer to internet crimes reported to the governmental Internet Crime Complaint Center. Methodology of evaluating loss amounts: FBI IC3 Unit staff reviewed for validity all complaints that reported a loss of more than $100,000. Analysts also converted losses reported in foreign currencies to dollars. The final amounts of all reported losses above $100,000 for which the complaint information did not support the loss amount were excluded from the statistics. How concerned are you about not being able to access online services due to cybercrimes?